When Wang Lijun appeared at the U. S. consulate in Chengdu on Feb. 6, American officials politely listened to his appeals handing the former Chongqing police chief faced authorities waiting outside the building. 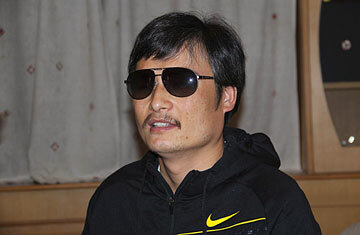 The current asylum request of the blind activist Chen Guangcheng, who escaped last week from house arrest in Shandong province, is trickier. Chen is currently in Beijing, probably either in the U.S. embassy or a U.S. diplomatic residence. One country has to give ground: either Chen gets asylum and is allowed to leave China, or he isn't. But both Beijing and Washington have much to lose from failing to stand their ground. The U.S. has consistently expressed concerns about the direction of human rights in China, which have regressed since the 1989 countrywide protests that culminated in Tiananmen Square. Chen is far from alone in having suffered torture, malnutrition and isolation at the hands of Chinese security officials. But he is one of the country's condemned dissidents whose plight has come to the attention of senior American officials and the public. Secretary of State Hillary Clinton publicly expressed alarm about Chen's continued arrest as recently as November 2011. Actor Christian Bale, best-known for his Batman roles, was forcibly prevented from visiting Chen by Chinese authorities near the residence where he was kept under house arrest  an incident filmed and broadcast to an international audience. We can be sure that the Chen issue is now being discussed at the highest levels in both countries. Domestically, President Barack Obama is accused of being too soft on China across a range of issues  from arms sales to Taiwan and Chinese trade and currency practices to pushing for human rights and other reforms inside China. Even if these accusations are unfair, Republican presidential candidate Mitt Romney increased the pressure on the President over the weekend by calling on Washington to protect Chen and grant him asylum, implying that this is a litmus test to determine Obama's toughness. Americans will also feel that their regional credibility is at stake. After all, the Obama administration's "pivot" toward Asia is not just a military affair. As Obama declared in relation to China in his November 2011 speech in Darwin, announcing an agreement to rotate U.S. marines on the Australian base, "prosperity without freedom is just another form of poverty." Obama said that non-democratic forms of government would eventually fail because "they ignore the ultimate source of power and legitimacy  the will of the people." In other words, Washington's advocacy of political freedom, free trade, and human rights is intrinsic to the renewal of U.S. leadership in Asia. As the only major power in the region that is not a liberal democracy, China is being reminded by Washington that it is the outsider despite its rising importance. With Chen now apparently under American protection in Beijing, simply handing him back to Chinese authorities will run the risk of the perception that Washington does not have the political will to make good on its promises. For China, the stakes are likely even higher, made more precarious by the fact that Beijing has a weaker hand than is often realized. If it allows a passage for U.S. authorities to fly Chen out of China, Beijing will fear establishing a prominent precedent for other prominent dissidents to try the same escape. Moreover, in a country that admits to spending billions on an internal security apparatus designed to enforce civil compliance and restrict unrest, any demonstration of willingness to compromise is viewed by the authoritarian regime as a dangerous concession. Yet, intransigence on this issue will not quell civil unrest, or inhibit the rise of other dissidents within China. It will heighten China's moral isolation, and leave it open to the accusation that the leaders of the world's second largest economy have yet to conclude a durable and legitimate political and social pact with its people. In short, if Beijing allows Chen's flight to freedom and safety, the Communist Party will appear weak and incompetent. But digging its heels in over the issue will only heighten the Party's image of insufficient legitimacy. When Secretary of State Hillary Clinton and Treasury Secretary Timothy Geithner arrive in Beijing for the U.S.-China Strategic and Economic Dialogue on May 3, both sides will want a face-saving resolution. Despite the likely official rhetoric of mutual respect and understanding, there can be no genuine win-win solution. Dr. John Lee is the Michael Hintze Fellow for Energy Security and Adjunct Associate Professor at the Centre for International Security Studies, Sydney University, and a non-resident scholar at the Hudson Institute in Washington D.C.